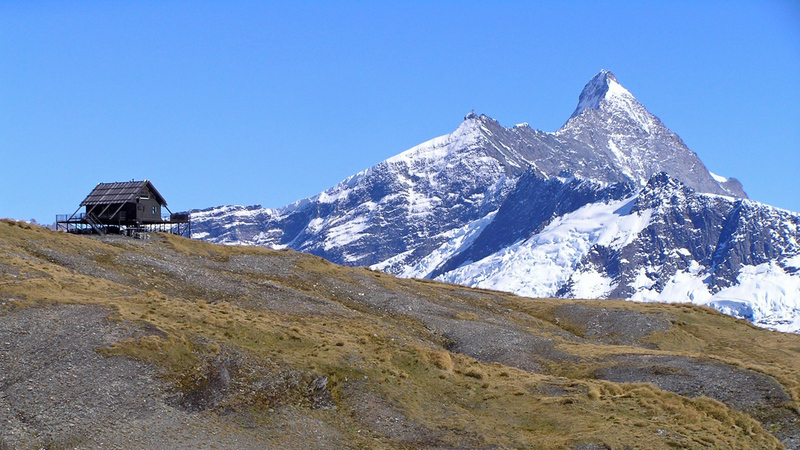 The Mt Aspiring Chalet is located on the boundary of the Mt Aspiring National park. With incredible views of Mt Aspiring the chalet offers luxury accommodation and an incredible base for alpine adventures. You can tailor your own Mt Aspiring Chalet experience. You can choose a relaxing trip enjoying the incredible mountain scenery from the balcony of the chalet, or an action packed adventure with alpine hiking or climbing a mountain. To get to the Mt Aspiring Chalet we take a scenic helicopter flight from the Matukituki Valley located near the Mt Aspiring National Park in Wanaka. The chalet and it’s surrounding alpine setting can be enjoyed year round by friends, families and small groups. Over the summer season the chalet is a perfect base for alpine hiking, the area is covered by tussock grass, wild flowers, and small alpine lakes, and offers a variety of terrain and options from short walks through to longer more challenging adventures. The chalet has two double bedrooms and a spacious loft and provides comfortable accommodation for up to six guests, and a bunk room for two staff. The chalet is relaxed yet luxurious with power, a hot shower and large windows with incredible views of Mount Aspiring with its tumbling glaciers.